I went to the Defend the Dream rally in Burlington this afternoon. There was a small, but vocal group of about 60 people there. A couple of the speakers had been to Madison in the past few weeks and talked about the energy they felt there. They were the best speakers there. Please keep your ears and eyes open for ways to get involved in this class struggle. I read a fantastic commentary yesterday written by Chris Hedges on Truthdig. 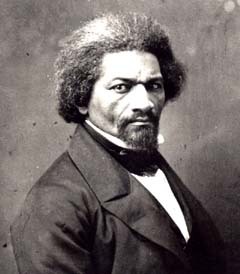 The title is the same as this post – Power Concedes Nothing Without a Demand – which is part of a quote by Frederick Douglass from 1857. “Let me give you a word of the philosophy of reforms, the whole history of the progress of human history shows that all concessions yet made to her august claims have been born of struggle. … If there is no struggle there is no progress. Those who profess to favor freedom and yet deprecate agitation are men who want crops without plowing up the ground. They want rain without thunder and lightening. They want the ocean without the awful roar of its many waters. The struggle may be a moral one; or it may be a physical one; or it may be both moral and physical, but it must be a struggle. Power concedes nothing without a demand. It never did and it never will. Please take the time to read it. He gives a great concise history of the labor movement in the U.S. and the sacrifices – in sweat, tears and often blood – they made. The eight-hour workday, the minimum wage, Social Security, pensions, job safety, paid vacations, retirement benefits and health insurance were achieved because hundreds of thousands of workers physically fought a system of capitalist exploitation. The time is now to rise up and take back our rights from the corporate power structure and their political lackeys. ‹ Everybody, up off the couch right now, please.